Although the battle seems like the cliched David versus Goliath, in this case it may just be Goliath versus Goliath. While the “fake news” debate rages in India another battle is being fought between a behemoth of print media The Indian Express and a relatively new website The True Picture. Although the battle seems like the cliched David versus Goliath, in this case it may just be Goliath versus Goliath. 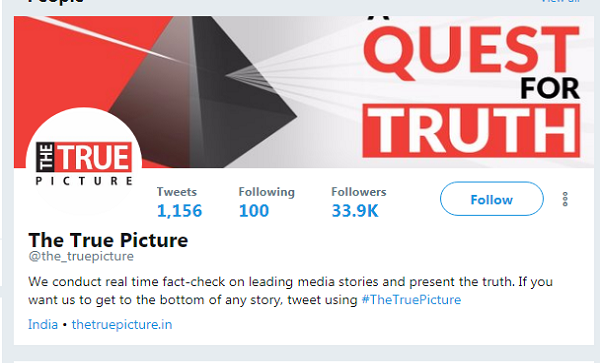 The True Picture shot to prominence on social media after several functionaries of the Bharatiya Janata Party (BJP) including high-ranking ministers tweeted its story over the weekend about four “fake news stories” the site had busted. The True Picture published a charged rebuttal, listing its defense of calling the paper’s two stories fake. It also accused the Indian Express of running a smear campaign. “Why are big media houses so rattled by an independent website? There seems to be a new caste system in the media, where new operations like The True Picture that call out false narratives and fake news are deemed ‘untouchable’ by the ‘high priests of journalism’ and anybody who plugs our pieces is considered to have committed an act of impurity.” – The True Picture wrote. 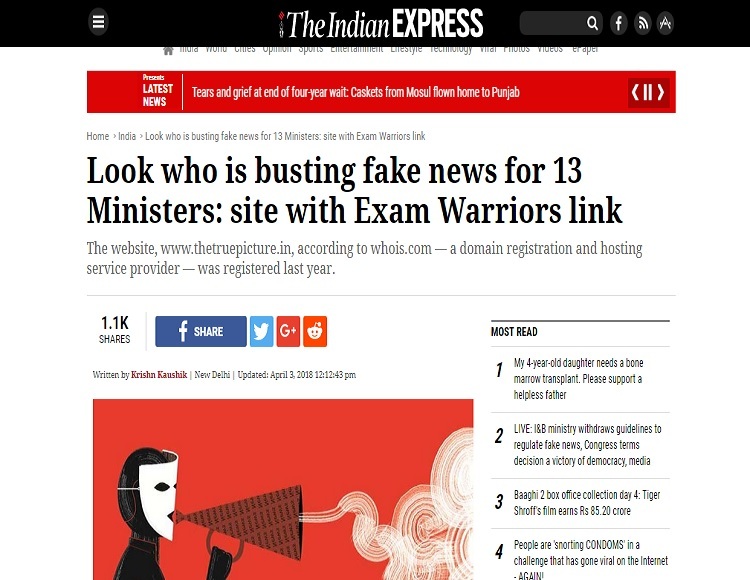 BOOM was investigating The True Picture before the Indian Express published its story on April 3rd as the website’s identity was shrouded in secrecy with anonymously authored pro-government fact-checks and data stories and no contact details. 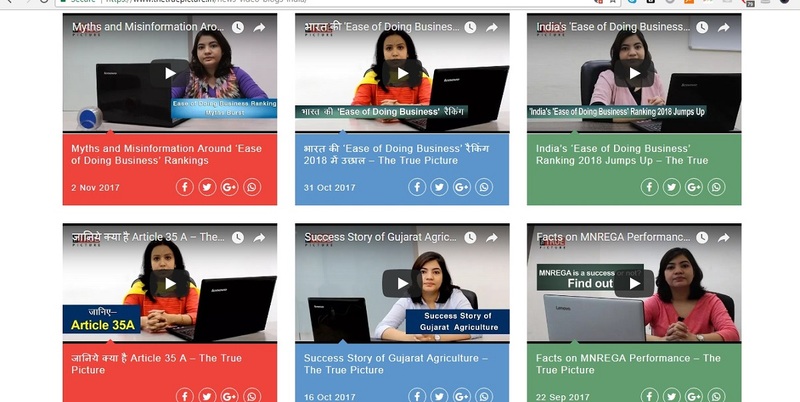 What piqued our interest was that government functionaries were involved in promoting stories from a website, which by and large kept its identity secret, until now. 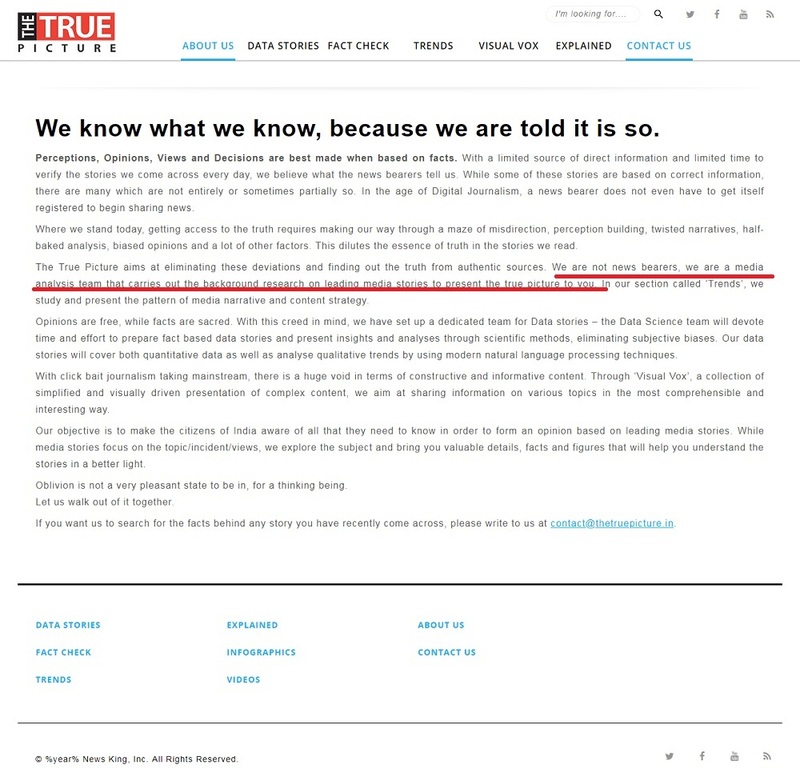 Started on March 30, 2017, The True Picture in its ‘About Us’ page does not claim to be a news website but instead calls itself a media analysis team. In its rebuttal on Tuesday, The True Picture referred to itself as an “independent website”. Our findings show that The True Picture’s link with BlueKraft Digital Foundation is more than a phone number. We list below the steps we have followed in trying to find out the individuals behind the website. 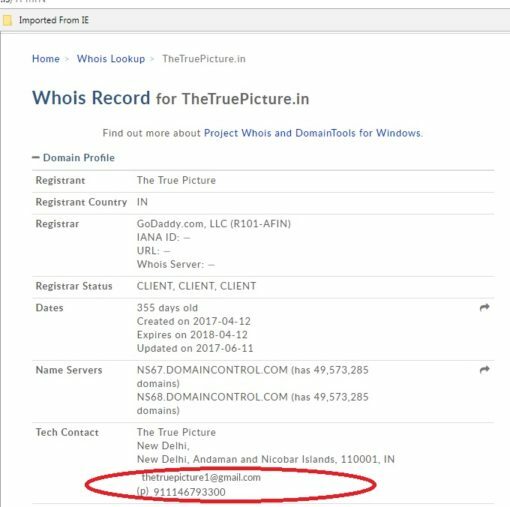 BOOM has also reached out to The True Picture through an email address (contact@thetruepicture.in) provided on its website and Akhilesh Mishra via email. We will update our story upon receiving a reply. A “Whois” search on the website domaintools.com lists a landline number (+91 1146793300) which is also shared by BlueKraft Digital Foundation, according to True Caller. BlueKraft Digital Foundation is a not-for-profit digital promotion company that works in the space of policy and governance. Rajesh Chandanlal Jain and Hitesh Sohanlal Jain are listed as two directors in the company, as per Tofler’s records. BlueKraft is headed by Akhilesh Mishra, a former director of the government’s online citizen engagement platform ‘MyGov India’. An alumnus of the Indian Institute of Technology, Dhanbad, Mishra has also been instrumental in Narendra Modi’s prime ministerial campaign. 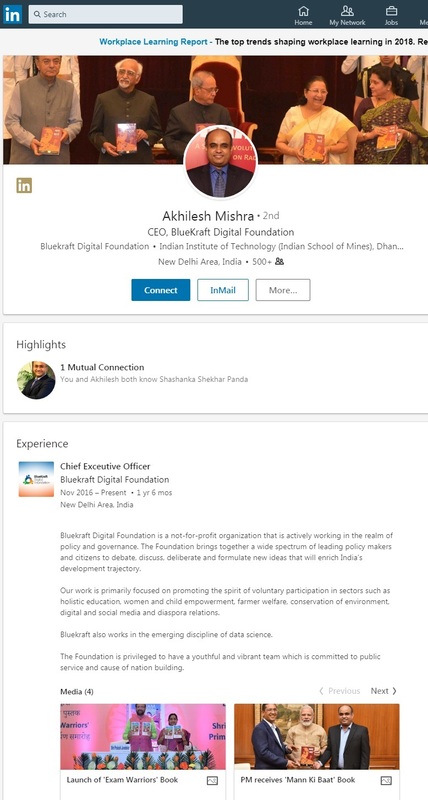 According to his LinkedIn bio he led the content division of National Digital Operations Center (NDOC) of the BJP, which was set up for the 2014 elections. 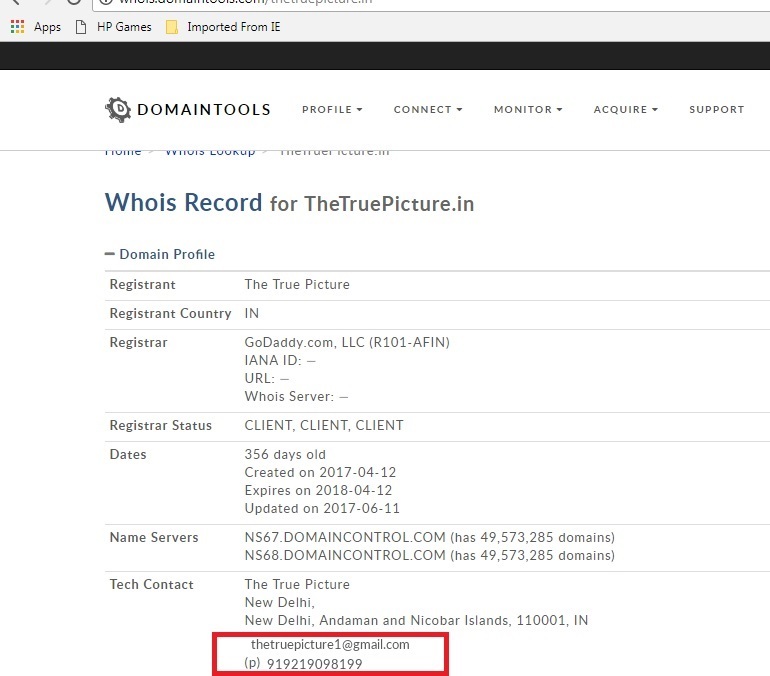 Registration details of The True Picture website were changed on April 3rd to remove the reference to the landline number registered under BlueKraft Digital Foundation’s name. Click here to view an archived version of the website’s Whois search. A new mobile number +919219098199 was added instead of the landline number. 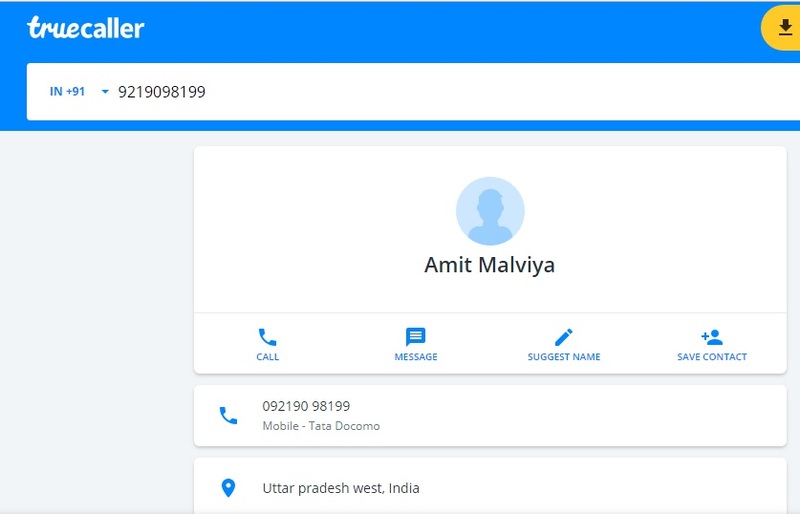 Though TrueCaller lists the number +919219098199 as one ‘Amit Malviya’; the number did not exist when we tried dialing it. It is not clear whether the phone number belongs to BJP’s information technology head or another individual with an identical name. BOOM also tracked down the LinkedIn profiles of two women who feature in videos created by The True Picture under the category ‘Visual Vox’ on its website. While the two women do not identify themselves in the videos, we looked at BlueKraft Digital Foundation’s employees on LinkedIn. Shubhangi Pandey’s LinkedIn profile described her as a content manager at Blue Kraft Digital Foundation. 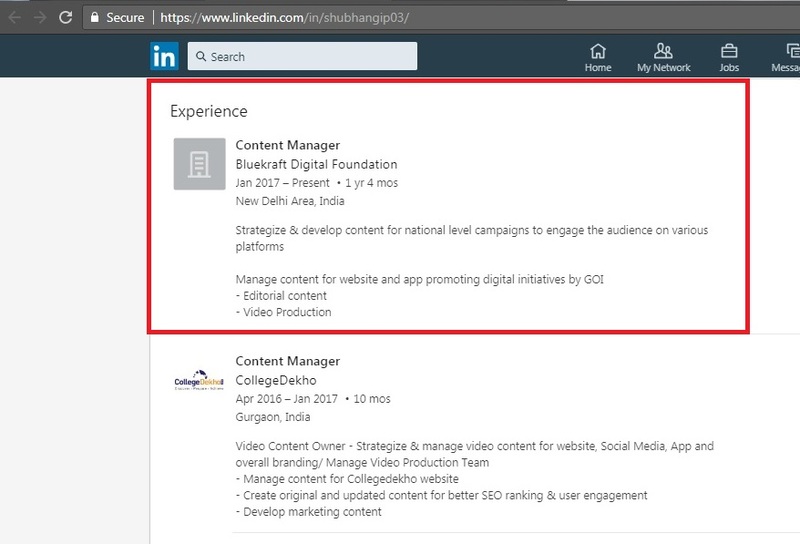 Under the ‘Experience’ category, Pandey’s listed her job description at BlueKraft Digital Foundation as managing content for the website and app promoting digital initiatives by the Government of India. 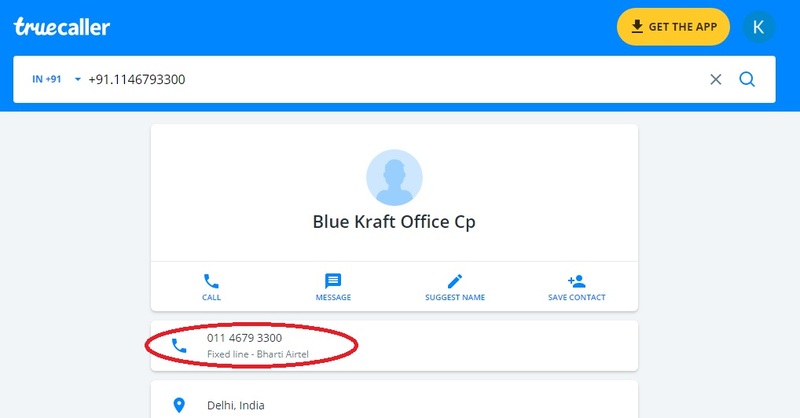 On Tuesday, Pandey removed references to BlueKraft from her LinkedIn profile. We also found one Shikha Dwivedi, who features in The True Picture’s Hindi videos. Her LinkedIn bio at the time of writing this story described her working as a Creative Manager at BlueKraft Digital Foundation. Akhilesh Mishra and The True Picture did not respond to BOOM’s email at the time of publishing this story. A Twitter user named Vijay Chada identified himself as the man running the website along with ‘volunteers’. Shubhangi Pandey’s LinkedIn profile was no longer visible at the time of updating the story. 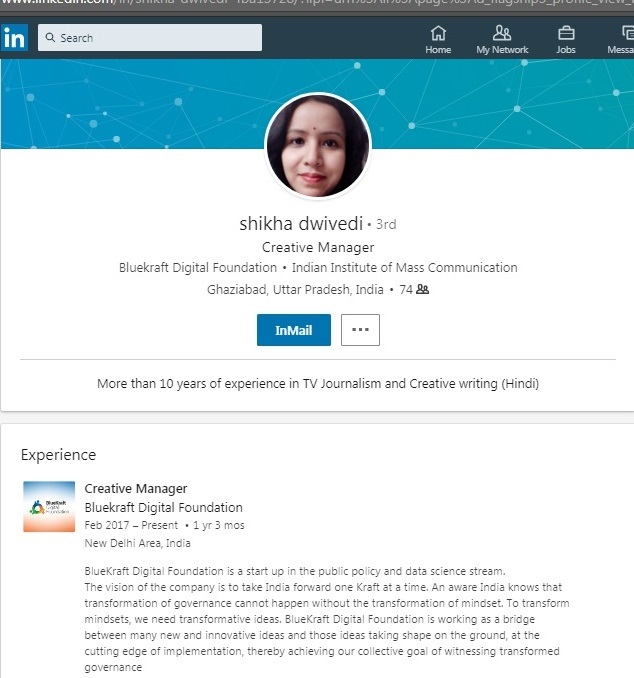 Shikha Dwivedi’s LinkedIn profile has been edited to remove the reference to BlueKraft. BOOM contacted Rajesh Jain and Hitesh Jain. Rajesh Jain said he had left BlueKraft Digital in October 2017. Hitesh Jain confirmed to BOOM that Rajesh Jain left the company due to personal reasons. “Bluekraft Digital Foundation is not associated with The True Picture . On Twitter yesterday Vijay Chada has claimed that he runs this website . Please direct all the questions to Vijay Chada.” – Hitesh Jain, Director, BlueKraft Digital Foundation wrote to BOOM.